In her latest novel, Elizabeth Laird returns to the Middle East. Set at the very beginning of the Syrian civil war, it’s the story of a middle class family (father is a government employee) which is caught up in the protests in Bosra and Daraa and forced to flee to Jordan. Elizabeth Laird has visited the camps and the novel is based both on research and her meetings with refugees there. Her account of the destruction of the family’s comfortable life and its desperate flight with no money and only the possessions that can be carried has the ring of truth without being as harrowing as it might have been. 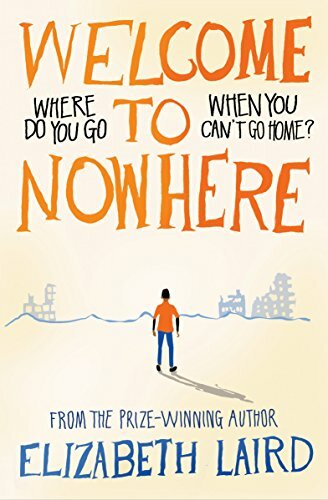 Partly this is because it is told through the eyes of the middle son, Omar, a resourceful ten year old, whose survival skills and entrepreneurial aspirations remain undimmed and uncorrupted by his experiences, even as the family ekes out a living in the refugee camp. It is also, too, because the worst atrocities take place off the page and Laird provides just enough of the situations she describes to alert us to their possibly horrific and tragic consequences without risking traumatising her readers. There is also a lot more of interest going on in the novel than the family’s experiences of the developing civil war. Omar’s intelligent elder brother, Musa, has cerebral palsy, a condition that necessarily has repercussions for himself and the other family members, and Omar acts as his protector from school bullies. But this does not prevent Musa from joining in the protests against the government. Omar’s older sister, Eman, has hopes of an independent life as a teacher, ambitions that her more traditionally minded father does not share and that in the chaotic political situation seem even less likely to be fulfilled. An adult reader may find that there is much in the novel that is not entirely convincing, particularly at the end, where Eman’s and the family’s futures are resolved rather too neatly. However, in bringing the fate of the victims of the Syrian conflict to life for young readers, both to inform and encourage sympathy and understanding, it is much to be admired.